Daniel is joined by software developer Buzz Andersen, who worked for Apple, Square, and Tumblr before recently founding Brooklyn Computer Club with Phillip Bowden. Previously he developed the popular Mac iPod utility PodWorks, and the groundbreaking iOS Twitter client Birdfeed. @buzz – Buzz’s Twitter account. Sci-Fi Hi-Fi – Buzz’s main blog. Modern Classics – Buzz’s cocktail blog. Cocoa Radio – One of the earliest podcasts focused on interviewing Mac community members. Apple Employee Silence By Self – Daniel’s 2005 article whining about Buzz’s decision not to appear on Cocoa Radio. Enter Magazine – Children’s programming magazine from the Children’s Television Workshop. Rocky’s Boots – Educational game released by The Learning Company in 1982. Robot Odyssey – Programming robots with another educational game from The Learning Company. Computer Chronicles – The PBS television show about personal computing. Hypercard – Apple’s groundbreaking visual programming environment. How to be a “Woman Programmer” – Essay in the New York Times mentioned by Buzz. University of Denver – Buzz’s alma mater. Nyx – Andrew Burt’s public access unix server. OLGA – The On-line Guitar Archive wikipedia page. NCAR – The National Center for Atmospheric Research. Ridiculous Fish – The home page of Peter Ammon, one of Buzz’s early Apple co-workers. Hype – HTML5 content creation app by Ryan Nielsen and Jonathan Deutsch. Neven Mrgan – Designer of Birdfeed for iOS. Secret Clubhouse – Buzz’s co-working space in Brooklyn. Matt Hackett – Buzz’s friend who was cited as prescribing a Hollywood model for software. Ed Nacionale – The designer who will be producing Brooklyn Computer Club’s logo. Sponsored by 23andMe. Order your 23andMe DNA Kit today for just $99. 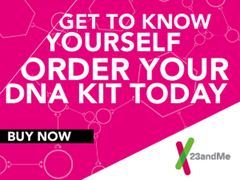 Order your 23andMe DNA Kit today for just $99.